Designed with the female triathlete in mind, the Women's Competitor Loose Singlet With Bra ensures everything from fit and support to comfort and performance. Advanced Competitor Woven fabric provides moisture wicking technologies that help keep you light and dry from the start to the finish line. Meanwhile, competitor mesh makes this tri top soft, breathable and flexible. The SCFLP6A is semi-fitted for a slim, no-excess-material athletic cut that provides maximum mobility. Engineered with graduated compression, this women's triathlon top provides ideal fit, circulation and muscle performance on race day. 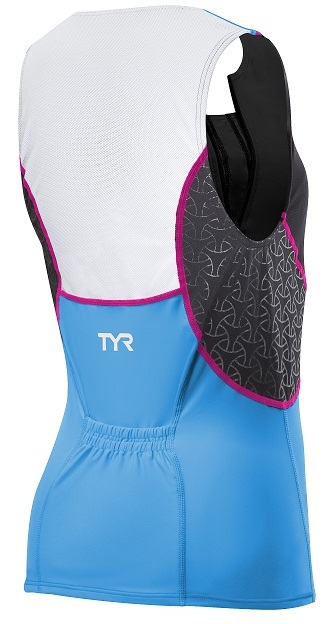 The TYR tri top features a built-in bra for convenient, secure support. Additional features include a 10" locking zipper for quick on/quick off use, back pocket for small storage and UPF 50+ capabilities for maximum sun protection.